Finally the promised post! Although I still haven’t had the chance to ‘meet’ Nanea by reading her book, I’ve really been enjoying having her. Her face is just so young and sweet looking. It has fast become a top, top favorite AG face mold. And since Nanea has a unique face mold I thought it would be fun to compare all the AG face molds! American Girl has so far created nine different face molds. 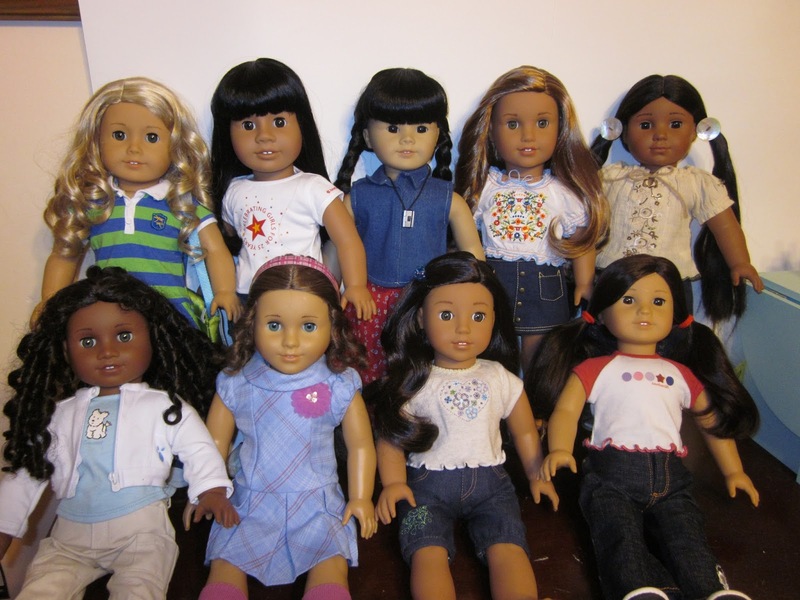 Starting in the back row, Classic (Lanie), AG’s first face mold, Addy (Miranda), #4 (Suki), Josefina (Lea), Kaya, Cecile, Marie-Grace, Nanea, and Jess. Some molds are really similar to each other and others are completely different. I find the Addy and Josefina to be very much alike. It’s funny how different the Josefina face mold can look depending on make- up, hair color, hair style, and skin tone. For example I find Nellie to be so very different compared to Lea. Wish AG would use the Addy face mold more often! The Jess and #4 face mold are also super similar. 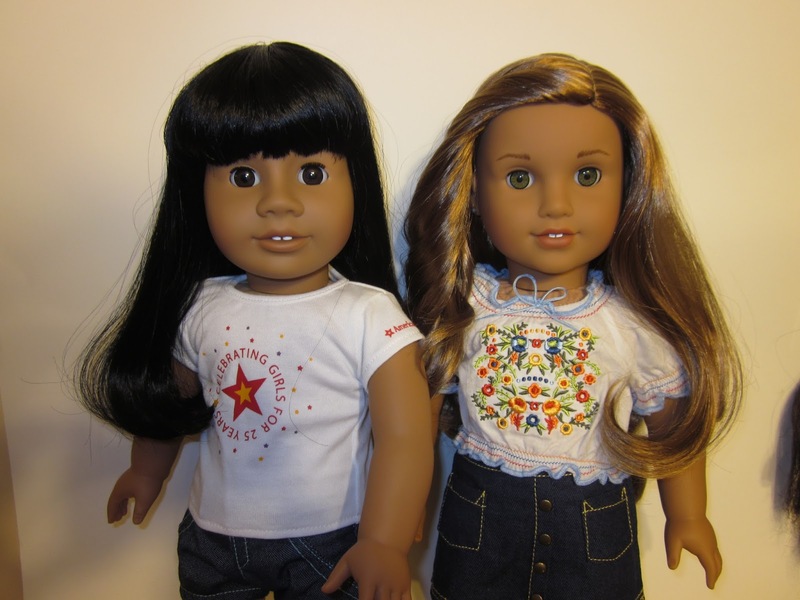 All of my friends and family who have seen these dolls have said to me, “These dolls don’t look very Asian.” I agree, but, that’s what AG has given us. Have you ever seen a custom doll with blue eyes with this mold? Very striking, and quite beautiful. People who don’t care for the Nanea face mold have compared it to a Wellie Wisher face mold. I can kind of see the resemblance, but Camille’s face is wider, her eyes are more spread apart compared to Nanea’s. I don’t know, I think they’re pretty different in my opinion. And finally, my top 3 favorite face molds! The classic mold used to be my favorite face mold for years and years until I finally got over hating Marie-Grace’s! When she first came out, she was just so different from anything AG had ever created that I just couldn’t make myself like her. It took years. Many years for me of looking at pics of her online to slowly and gradually accept her, like her, love her, and then when I finally bought her on ebay I fell completely in love with her sweet heart shaped face and sparkly blue gray eyes! She is now a very welcome member in my doll world and now I can’t believe AG has only made one doll with this mold! It’s why I’m so disappointed with their customizing options! No Marie Grace, #4, Nanea, or Kaya options for a face mold so I highly doubt I will ever make a custom doll. Lanie comes the the closest to my mini me which is why I chose her to represent the classic mold! What’s your favorite AG mold? Why? Have you disliked a mold and than after some time come to really like it? If you could create a custom doll would you choose a mold you can’t use? What would you create if you could? Great post! It was interesting to see all the different face molds side by side. My favorite face mold is the classic face mold, because, well, it’s classic! 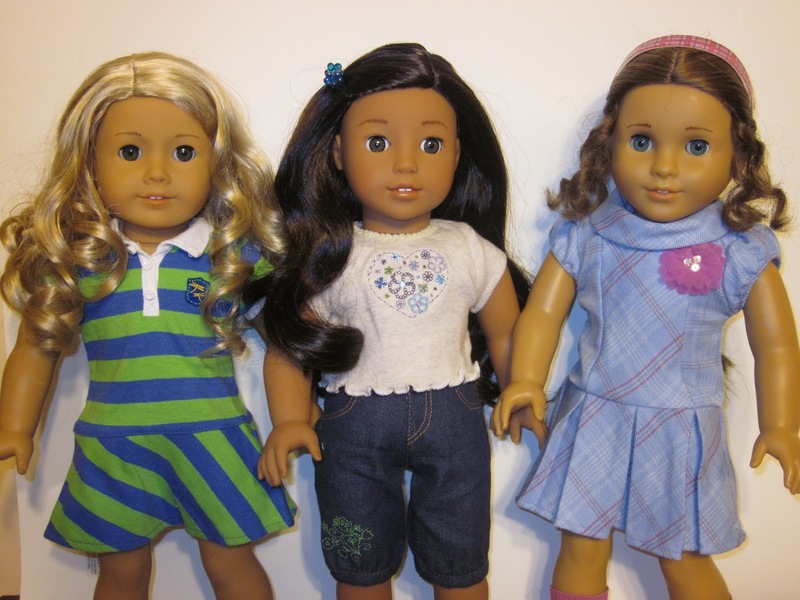 Molly, Samantha, and Kirsten are some of my favorite AG dolls, so I guess I just like older things better. I’ve also always loved JLY #4. Even though they’ve made other Asian dolls, she has always been unique to me. 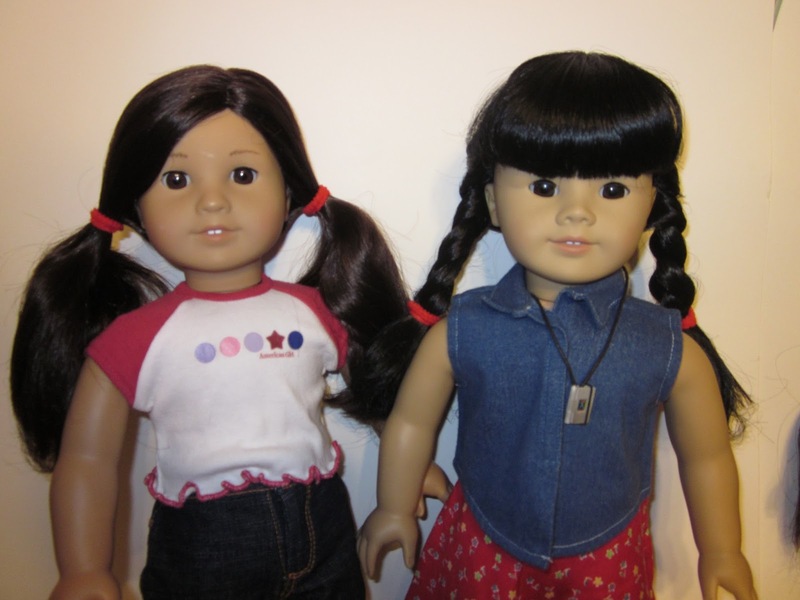 What do you think could be done to the face mold to make the dolls look more Asian? I still don’t really like Nanea’s or Marie-Grace’s face molds, but I don’t think my feelings against them are as strong as they were. I do think that it would have made Marie-Grace’s face mold more normal if they had used it on more dolls, but it seems like Marie-Grace didn’t sell very well, so it might not have been a good decision for the company. I guess perhaps if the Asian eyes were just a little more narrow. And yes, I agree about the Marie-Grace mold. I just wish AG would have given it another chance. I’m not sure whether I have a favorite mold… the Josefina is nice because it seems very adaptable. I’m not a huge fan of Sonali mold but if I had more exposure to it I might like it more. Haha! Yeah! Only two of her outfits are in my collection her BF meet as a Halloween costume and the tunic outfit! I’m sure your Julie is highly disappointed in me! heehee! Fun comparison! I adore all of them so much, it’s hard to have a favorite. 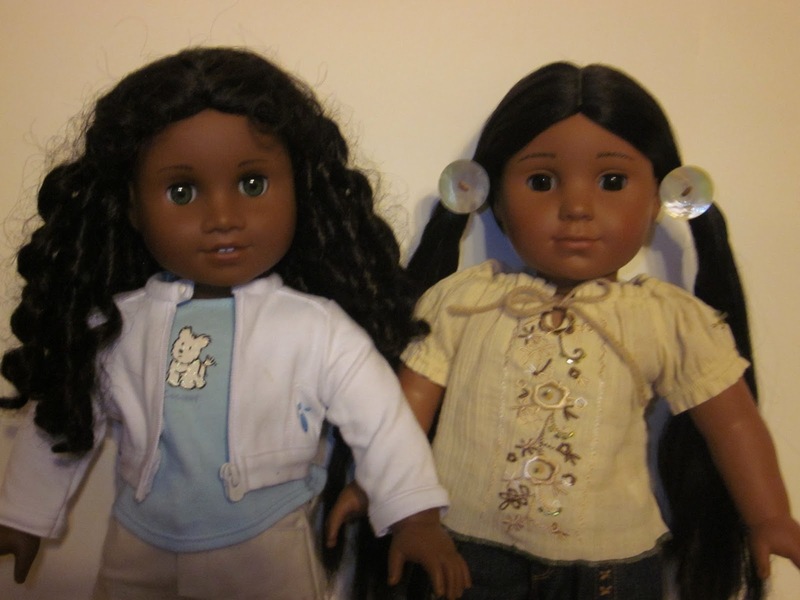 Right now I would say my favorites molds are Nanea and Sonali. Great comparison! I have my eyes on the MG right now! I probably don’t have to tell you (or anyone else that follows my blog) that the Jess mold is my favorite. I do agree though, it isn’t what I’d call a true Asian mold, it’s more Polynesian looking. I guess maybe because Jess wasn’t 100% Asian, they decided it was okay. I was like you about Marie-Grace, but then I saw some really fabulous pics of her on another blog and decided to get her. I think she is one of the prettiest face molds, I don’t understand why they don’t make her available again. Pointy, hm thats interesting. Wow, I kind of think her face is too round! But I can see how it takes some getting used to. Maybe youll come around to liking her. Just curious, do you like Tenney and Leas faces? I was looking back at your pictures, and now I totally see why I don’t care for Nanea as much. It’s her eyebrows. They are too high on her forehead, and it makes her look surprised. Maybe it’s just me, but I was comparing in that last picture with Marie Grace and Lanie and Nanea’s eyebrows are placed quite high. She also doesn’t appear to have as much of a brow ridge. Just an observation. I will still have to see her in person. Oh. Commented on your first comment before i read this. What do you think of Lea and Tenney? Do you think their eyebrows are too high? Because sometimes i think that.